First question: Are there plans for this adding automation support for AUfx soon? Second question: Any reason why AUi params cant be automated before being mapped to a macro knob? Some AUi's have hundreds and hundreds of parameters, sometimes improperly named, it's poor workflow trying to find the correct one to map. Definitely my number one request. Hi, Matt said that au fx automation will be added, but I don’t know how soon. Totally agree that it’d be easier to just move whatever knob you want to automate, rather than having to find it, map to a macro, then move the macro knob. 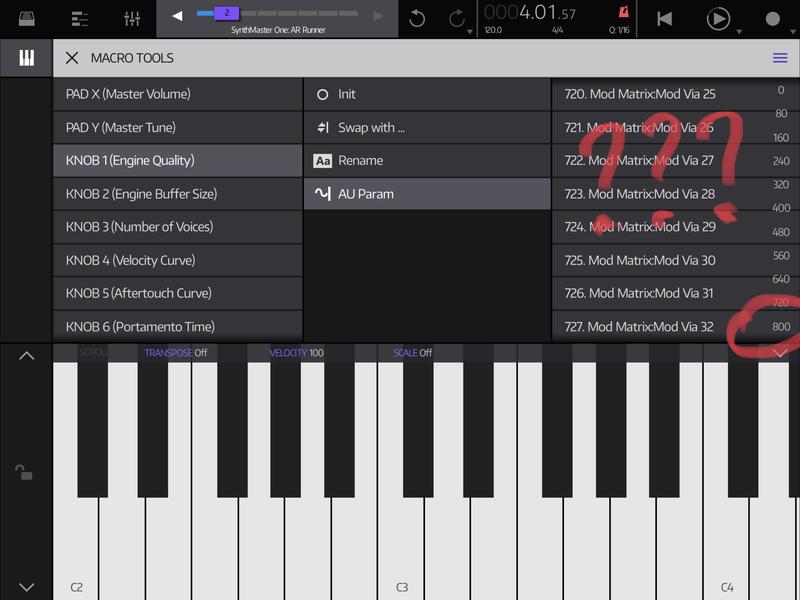 AU fx automation being added doesn't necessarily mean that non-macro based AU UI automation for instruments would be added though. At the end, lets face truth - in 90% of cases you never need automate more than 10 parameters for singke track..
That is reason why automation of instruments is binded to macros - instruments have obviously a hell lot of parameters. If you make macro <-> UI param mapping, and you want record realtime tweakimg, you are not forced to tweak just mapped macro knob - you can now easily tweak directly mapped parameter in plugin UI and automation will be properly recordsd same way like if you tweak corresponding macro. You can save default mapping for given instrument, so if you load that instrument anytime later, it loads with your mapping. right hamburger menu icon. After macro knobs are activated for editing, tap one of them (no matter which). In left list with macro knobs scroll down to "All Macros" - tap this option and you will see "save default map". That is it. I'm not sure which method will Matt choose for implementing AUfx automation, but my bets are that for AUfx it will be some form of macro screen too - to avoid cluttering of automation editor by FX with tons of params like for example Fabfilter Q2. Here’s why the current approach with assigning macros doesn’t work. Exhibit A: two params with the same name, one works one doesn’t. Exhibit B: finding a param among EIGHT HUNDRED other ones. I think simply having it so that only recorded/automated AU parameters via the AU UI show up in the sequencer would easily solve this clutter. If a parameter was never automated it should not show up in the sequencer. Other apps do this already and it works fine. Huge +1 on this. Don’t show the automation lane if there’s no automation on it. Use audio unit UI to automate. All problems solved. On other side - in instrument, where you can quickly switch between macro and ui tabs, learn function like i described would be super easy to use, it doesn't need almost any additional UI and it would allow you to choose what you want to automate in almost no time. I get it, but yah to each their own. I always just twiddle a knob and record automation first, not because I am forced to, but because I simply like to. For me it is much better than lists or macros. The only time a macro is appealing is for X/Y control and then having a learn function like you mentioned would be good. For me using the AU UI is especially important in things like Aparillo or ProQ2 where the visual feedback is key to the actual function. 800 parameters is still 800 parameters. Proper names or not I am not interested in scrolling through them. that's ok.. my point was that that proposed solution just adds more complexity.. after 4 years in beta team (and 25 years of coding - i'm coder too although not music apps) i learned that it is always important to go to very deep core of problem, identify what is REALLY problem which is neede to be solved and then solve it the way which needs minimum new UI/UX features. So lets back to basis. What is REAL problem here ? From my understanding it is that curently it takes too much effort to find what you want to automate, because you need to scroll throuhg gigantic list of params, often with weird short-cur names, to find that one you want to tweak, to add it to macro. Why have an extra layer of indirection with macros at all? You could add this ‘learn’ functionality for creating automation lanes instead of creating macros. I disagree. The problem is insisting on creating a layer of abstraction over AU params, in the name of uncluttering UI. This is a logical fallacy: presenting a solution to a problem created by the solution itself. In other words, this isn’t the only way of reducing clutter. Macros also are useful on their own, and that’s a whole different conversation. Do you think it would be intuitive UI/UX to be forced to go out of automation editor which is third level of window inside sequencer (sequencer > clip > automation) to instrument UI - which is completely different screen, tweak there knob, and then go again back to automation editor, just to add new automation lane ? Hell that would be insanely overcomplicated :-) Not speaking about situations like what if i delete all recorded automation - now this lane should disappear ? And if indecise again tomedit it, now i have to again switch back to instrument UI tweak knob and then go again back to completey different screen which is at least 3-4 taps away ? Bottom line: the appeal of NP2 is the clean design with a simple and intuitive interface but really complex innards that you can dig into and move around. That SIMPLICITY is key... and mostly amazing throughout the app. However, there are a few areas that seem to have mixed the boat —automation certainly one of them. This concept has been done much better in lesser apps. Hope to see this simplified in future updates. I do agree that the list of possible macro control destinations can get way too long. Ideally, it would work exactly like assigning a macro control on Obsidian: enter macro mapping mode, find your control and touch it. How would you propose that one automates ProQ2? thats why i think macros would be good concept also for AUfx ..
Only being able to set up ten parameters for automating ProQ2 parameters would render it useless. The point is to explore and determine what needs automation on the fly, not locking into a specific ten. This is even how I feel about synths, just not quite as acutely as an EQ. But, eh, in the end if this isn't the app for automating AUs like ProQ2 (soon to be the amazing ProQ3), then so be it. No need to invent anything. "Do you think it would be intuitive UI/UX to be forced to go to outside of the plugin to a different view, pick a macro knob there, press some learn button hidden in some menu, go back to the plugin, turn the knob you wanted to turn, learn it, then actually record automation. Hell, that would be insanely overcomplicated." Instead of saving macro knobs templates, you could save automation lane templates. There, problem solved again, without an extra level of abstraction over AUi. I don't understand this insistence on the macro knobs being the only way. Alas, this is @Blip Interactive's app and they can do whatever they want, I simply echo the fact that it's a shame other apps actually do this better. No matter how much of a fanboy of NS2 I might be, the reality now is that automation is either a pain at the moment, or just not possible at all. What about AUs that legitimately have lots of params? Like modular synths. What about AUfx that can end up having hundreds of params as well? Like equalisers. This isn't a problem with the AUs. This is a problem with NS2's approach. ... Not speaking about situations like what if i delete all recorded automation - now this lane should disappear ? I think the point was that if the lane disappeared, adding back automation back later isn't instantaneous. Regardless of whether or not this workflow makes sense to us, the most common workflow shouldn't suffer because of these edge cases. Being forced to use macros to automate something is pretty ridiculous. Automation of aufx is urgently needed and instruments should be automatable via their own gui without neccessity for macros. Use macros only for multiple parameter automation. @flockz I strongly disagree. 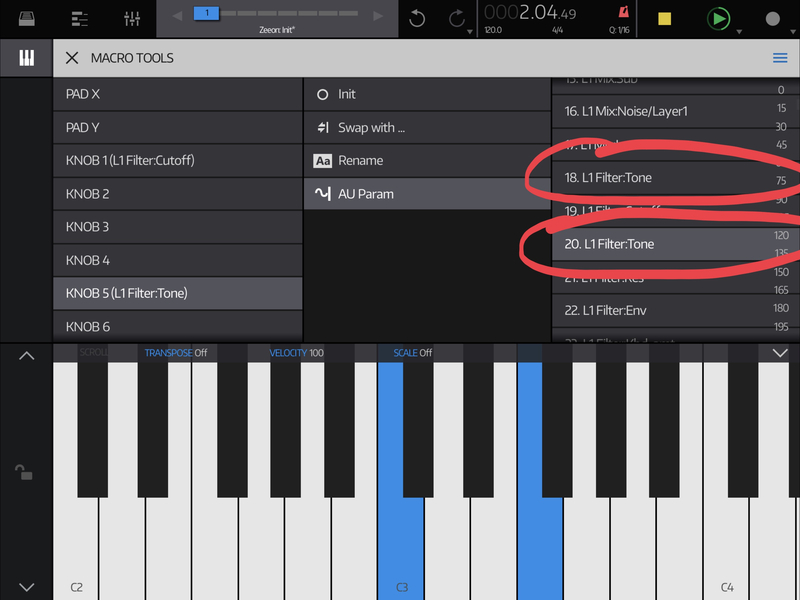 It not only declutters the automation tracks (which on iOS can be a serious impediment to workflow), it also encourages the good habit of planning for automation as part of setting up synth presets and tracks. Being forced to use a macro per au gui automation parameter feels bit like having a knobby hardware synth and having to route each knob to another controller just for the sake of it. iOS has the benefit over desktop/laptop of being able to just dig in and tweak knobs with fingers on touch GUi. That’s one really big USP of iOS over laptop/desktop. This implementation really doesn’t take full advantage of that imho and instead adds extra steps to setting up/using automation. Maybe I just don’t understand the benefits or they don’t apply to my use/workflow.